We are OPEN on Thanksging and Christmas! Welcome to the Boston Great Barbeque for great tasted barbeque! 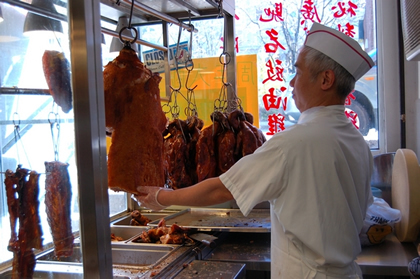 The Great Barbeque is a wonderful Chinese Siu Mei (烧腊) restaurant located in Boston's Chinatown. Special in a variety of barbeque chickens, ducks, pork, beef, lamb and conjee(粥), rice noodle(粉), noodle(面) and rice(饭). We use the freshest meat and Hong Kong secret flavor recipe grill for you and your family every day. 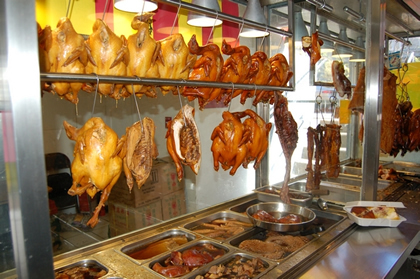 We also supply the barbeque duck to many Chinese restaurants in Boston. Our salted spice chicken, soy sauce chicken marinade with the unique secret sauces (秘制咸香鸡，豉油鸡). The taste is so good, many customers love it and return for it. Custom Mr. Qian said: I tried all chickens in over Chinatown, this one is the best! Also supply all kinds of combo(拼饭), mutton on the rice(羊肉饭), salted meat egg yolk rice dumpling(蛋黄咸肉粽) and various special sauces and so on. Cha siu (叉烧) - barbecued pork, Siu ngo (燒鵝) - roasted goose, Siu ngaap (燒鴨) - roasted duck, White cut chicken (白切雞) - marinated steamed chicken..